e.l.f. Cosmetics believe in luxury for all—and that high-quality, cruelty-free makeup and beauty products have never been more within everybody's reach. Dedicated to a wide range of luxury cosmetics to make premium products accessible to everyone, everywhere. With go-to products that withstand the test of time, elf Cosmetics is the best-kept secret of many YouTube makeup artists and Instagram It-Girls. elf cosmetics provides you with everything you could need for eyes lips and face, without the prohibitive price tag. Professional quality and trend-driven products, with none of the pitfalls! 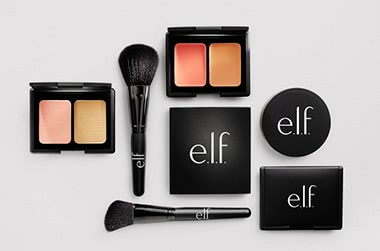 Adore Beauty is an official stockist of elf Cosmetics. Free standard Australian shipping. Showing 20 products of 71. I love this brush for all my cream precision work! I have both the large and small size however I like the bigger one for powders and this one for creams. It blends my blush and highlights so perfectly despite the price tag. This brush would also be perfect for beginners experimenting with creams as it's so small and easy to fix if you make a mistake. it works amazingly for such a low price, but it is so small and doesn't have a lot of product as well. so i don't know how i feel about the product amount. Did not lengthen or thicken. It's just not a very good product.